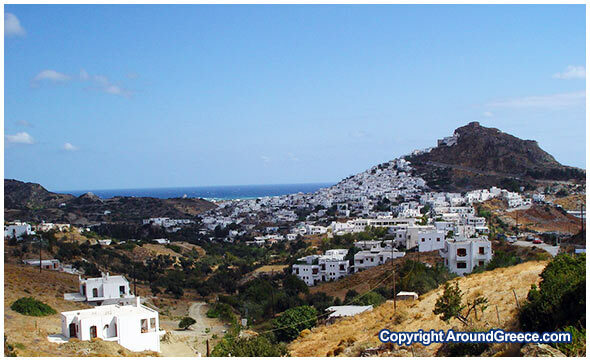 The capital town of Skyros is Chora ( Hora ), which is located on a hill underneath the dominant Byzantine castle. Due to it’s geographical position, it appears as though Chora is keeping a watchful eye over the island. The bright white houses, with their flat roofs, are built amphitheatrically next to one another, creating a very picturesque and charming image, that welcomes visitors arriving at this beautiful part of Skyros. The town of Chora is surrounded by beautiful and charming coastal hamlets, that are fully developed for tourism, and which offer all of the modern necessities for todays traveller. Some such popular holiday destinations include Magazia ( with the beautiful beaches ), Molos and Pera Kampos. The town of Chora is full of winding, twisting streets that simply cry out to be explored. Following the stone paths, you can wander around the town for hours, soaking up the traditional architecture, imagery and of course, the wonderful panoramic views that stretch out to the horizon. There are many interesting places to visit in Chora, such as the Byzantine fortress that tops the town, and keeps a watchful eye over all that happens below. Worth visiting is the beautiful church of Agia Triada, where you can see the beautiful frescoes inside. Another place of interest is the quaint whitewashed monastery of Agios Girgios, which was originally founded in 962, and which underwent a restoration in 1984. As you wander around the town, you will find an open square that overlooks the charming beach of Molos. It is here that you will find the bronze statue that was erected in honour of Rupert Brooke, the much celebrated poet who resided here in Skyros. The square is known as the Brooke Square, and visitors here can enjoy some wonderful views overlooking the east coast of Skyros and out towards the deep blue waters of the Aegean Sea. Chora is a town that all visitors to Skyros should visit. It is a very interesting part of the island, and one with great history and tradition behind it. You will find a great selection of accommodation and hotels scattered all around here, and it makes an ideal and convenient base from which one can venture out and explore other parts of the island.